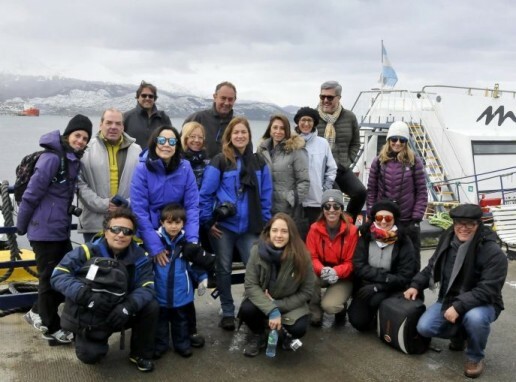 In the 2016 Tiradentes Holiday (20-24 April), Amyr Klink, the most famous Brazilian navigator, returned to one of his favorite places: Ushuaia, known as “The End of the World”, visiting landscapes that were part of many of his nautic expeditions. With an outstanding curriculum, Amyr Klink is graduated in Economics, also an entrepreneur, husband and father of three ladies, author of six best sellers. With passion for nature, vocation and technical knowledge to understand the mysteries of the ocean, this wise and obstinate man that faced so many challenges in his career, such as a 100 day solitary crossing paddling in a rowing boat over the Atlantic Ocean; and living 12 months alone in his Paratii sailboat in Antartica. The argonaut has accomplished a total of 22 expeditions to Antartica, mostly in boats crafted by himself, and has become one of the most known public figures not only in Brazil but worldwide. Arakur Ushuaia Resort & Spa invited guests to join Amyr in a 4 day tour package hosted by Amyr Klink, during Tiradentes Holiday, where he shared some of his stories and life experiences & learnings not only in a speech at the hotel, but also leading the guests over Ushuaia’s beautiful attractions. The best of the best? One of the moments with Amyr was , of course, in the sea, when the group (total of 20 guests) boarded in a private catamaram to navigate along the Beagle Channel. Wildlife watching with champaign, appetizers, and the company f Amyr Klink was indeed a very exclusive experience. – US$ 2.100 for two people, includes breakfast, navigation and Amyr’s speech, and a trekking to Reserva Alarkén also hosted by Amyr Klink. – Double Standard room category. Does not include flights.